The Accountant is a somewhat rare thriller because it actually takes the time to be about something and then allows its characters to express how they feel about it. So often these days, thrillers seem hell bent on rushing through their narratives and shortchanging the people just to get to the "showy" stuff, like fights and chase scenes, as if it's only these elements that are capable of "thrilling" us. And while The Accountant certainly isn't lacking in these departments, the impression we get from director Gavin O'Connor and writer Bill Dubuque is they take a back seat to the more complex plot and people. And they are arguably complex, because I feel the need to re-watch the movie just to connect all the dots. What tells me The Accountant is a good movie, though, is this something I actually want to do. 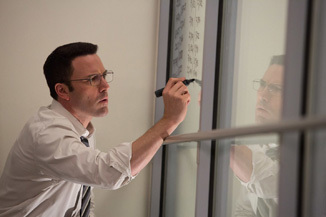 Ben Affleck plays the titular character, whose real name is Christian Wolff. Christian has a high-functioning form of autism, which makes it very hard for him to leave things incomplete or let go of tasks he's made a part of his already regimented routine. Nevertheless, his mental handicap has made him very good with numbers and logic. It's also made him especially good at combat. We learn early on Christian's role as an accountant is merely a front for his real day job: a hired killer for various crime families. He receives instructions from the computerized "Voice," and with each new assignment, assumes the name of a famous mathematician. His chosen field has has made him very wealthy (just consider all the priceless paintings he keeps in his getaway trailer, which he keeps fully stocked in a storage locker), yet he remains a social outcast who has to consciously speak with intonations lest he comes across as robotic.